The UHANS Max 2 is a huge phone that looks a lot more expensive than it really is. Due to its big screen is perfect for video consumption, but despite being created for fans of mobile photography it often produces poor result. Unfortunately, it also lacks LTE bands in the US, so interested customers located in the States will have to skip it. So far, The Uhans Max 2 combines a large screen diagonal and an eight-core processor. Fans of play will be able to run on it most games at medium and maximum settings. and at what price level it is located. Games with good graphics from the first person, third person or race with realistic graphics will be given to the smartphone with difficulty, at minimum or medium settings. 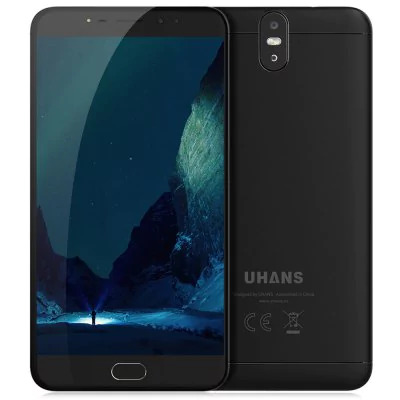 you can be purchase Uhans Max 2 on GEARBEST with the price value of $129.99 using this Coupon Code: UhansM. The fingerprint reader, quality dual rear camera, and large battery make it a surprisingly attractive phone. It’s a solvent model which every person looking forward to budgeted phone must buy. Positive: Good price; excellent display; powerful processor; 4GB RAM; nice cameras; fast fingerprint sensor. Negative: Only 64GB ROM. Positive: Good price; nice display; decent hardware. Negative: Poor cameras; no fingerprint sensor. 79.2%: This rating is not convincing. The laptop is evaluated below average, this is not really a recommendation for purchase.